Congratulations on adopting your ARF pup! For some training tips and tricks, follow this link. ​In addition to training you want to have a well socialized dog that doesn’t get flustered in any new situation. Again, having adopted a SATO you are off to a good start! Here is some information about the importance of socializing at an early age. If you are in need of daycare or overnight accommodations for your new pup, give Sandra a call or send an email. Sandra takes care of dogs in her home in Ewing, NJ. The secret to being successful when fostering or adopting a rescue dog is giving the new dog time to adjust to you, your family, the home, and other pets in the new environment -- before introducing him to new people, taking him out on any big adventures, etc. While we realize every dog is unique and every dog adjusts differently, for the most part we recommend what we call the "Two-Week Shut Down." Why The Two-Week Shut Down? The Two Week Shut Down is a time familiar to a dog’s mind -- it mimics the whelping box when first born, when the puppy’s eyes are not open and it relies totally on the mother’s ability to take care of it. By smelling, sensing, and listening, the puppy starts his journey into the new scary world. New adult dogs come into our home the same way -- "A journey into a new and scary world." By giving the dog a “time out” the dog can learn its new world, its new people, and begin to relax and blossom under the care of the new caregiver. While we all want to run out with our new dog and show everyone our new pet, we forget that even an adult dog is now back to a puppy-like mind; all is new. The voices speak a new language, cars might be new, leashes and handling might be new. Even petting and acceptance of a pet is stressful on a new dog. “Who are you? Where did you come from? Where am I going? What is expected of me?" The dog thinks! Just like a newborn baby, we wouldn’t rush out and pass the baby from person to person. We set up a stable and safe environment. Our new dogs are just like that. We also give the rescue dog a bit of time to heal, mentally, and physically, in a safe and comfortable zone. When new dogs are stressed out and not given that calm environment and period of adjustment, the only way they know how to get their point across is to act out or "misbehave." The dog may growl or become nippy out of confusion or fear. What is expected of me? Where am I allowed? How the Two Week Shutdown works: For the first two weeks, a dog takes in their new environment. By pushing a dog too fast and throwing too much at the dog, we look like we are not the leaders and the dog can feel it MUST defend itself. We coo, coddle, drag the dog from home to home, from person to person, and the dog has NO idea who WE are. To the dog, you are a stranger. This is the time for the dog to be in a calm atmosphere, getting to see YOU, meet YOU, hear and take in the new sounds and smells of your home. Crate the dog in a separate room or limit it to one separate room. Leashing is an option. This also teaches the new safe zone when the dog is around you and other humans in the home. You can leash the dog to your belt or under a piece of furniture. This also stops the dog from reacting if you have to get him off of something like the couch. You are not reaching in and grabbing onto him, just tug gently on the leash, say "come" and there you go. No conflict! Exercise is a must. All dogs need to burn off energy. Do fun toss the ball games in your yard or on a lunge line if no fence. Remember to just have fun. Let the dog run and explore in the yard. TEACH the dog by doing the shut down, that YOU are the one to look to, that you are now here for the dog! He can trust in you and look to you as its new leader. Then on walks you will see the dog look to you when he sees something, to see what your reaction is, lessening his mind about having to defend or control the environment. He has YOU. The dog now can relax and enjoy the walk more. Once exercise/yard time is finished put the dog back in his/her crate. Let it absorb, think, and rest. If the dog goes to his crate on his own, he is telling you “I need a time out." Allow him this time. By having the dog out for long periods of time we are forcing the dog to keep accepting all new things. By putting the dog away we are asking him to accept a few things, then go think and absorb. When we get him out later, we introduce a few more things, so it not overload on the dog. No new buddies! Do not introduce the dog to other pets for these two weeks. They can be side by side in the crates if you cannot totally separate, (not nose to nose for they can feel defensive). The reason it is important not to introduce the new dog to other dog(s) in the home is because some dogs will bond instantly with the other dog(s). This can lead to some other issues, as the dog will look to the other dog(s) for guidance and not YOU! Ignore Bad behavior. Ignore crying and/or barking. If you run to the dog each time they bark, whine, or cry, you are teaching the dog that doing those things gets your attention. The dog must learn to be secure when you are not there. Use the leash to correct jumping, exploring counters, etc. Praise good behavior gently. For example, the dog is sitting nicely next to you. Touch or softly pet the dog “good boy/girl." Let them know you appreciate GOOD behavior. This makes naughty behavior not so fun if you ignore THAT, but praise the good! Literally in two weeks you will see a change in the dog and begin to see its honest and true personality. They will be well behaved and literally shut down themselves these first few weeks. Once the shut down time is over, they relax and the true personality begins to shine through! So, please, if nothing else for your new dog, give it the time to LEARN YOU as you are learning who they are! This method works on shy dogs, confident dogs, abuse cases, dogs who were previously chained, rowdy dogs, all temperaments! They will look to you for guidance. You will gain their trust and show them, calmly and fairly, what this new world is like. They will relax and feel safe. There is no need to force the point that we are its leader. Slow easy guidance, patience, showing them what we want them to do in a new home is the best way to help the new dog adjust. We instill that we are worthy to the dog to be its leader! So please for the sake of your new dog, slow down – WAY down. Give them a chance to show you who they can really be! *Created by Heather Beck, owner of K9 Lifeline. Create a structured life for your dog using primal instincts and needs. The majority of K9 Lifeline’s training program utilizes the crate. By using natural den instincts of a dog one can give the dog a safe place to truly rest and relax. Although the crate is not always used it is highly recommended at the beginning to help establish a schedule for the dog, including feeding, house breaking and down time for the dog and owner. By coordinating a routine of working then resting, OR working, eating, then resting, dogs are given the same opportunities they would use in the wild to have to think and exercise before food and rest. Using proper scheduling and consistent “house rules” a dog will become more confident in your leadership. Also, dogs become calm and focused during interactions when given the proper amounts of rest combined with meaningful activities. Dogs are often overstimulated and under challenged mentally and physically. This portion of The Basics Program helps to bring the dog back to a natural state of mind and body. Crate training is the most effective ways to train a dog of any age. When using a crate to train a dog, an individual is working with the dog’s natural behaviors. Canines throughout time (and even today’s modern canines, such as wolves), live and raise their young in dens. Dogs' natural instincts are to not go to the bathroom where they sleep; they learn this from their mothers. Dogs feel the same safety and warmth of the den when they are in a crate. This idea can be used to easily house break a puppy or older dog. Another benefit of crate training is that the dog is somewhere safe and comfortable when on one is around to supervise the dog’s behavior. The crate is a positive gadget and shouldn’t be viewed as a “babysitter” for the dog. A dog that is crate trained has the feeling of its own safe place. When taking the dog on trips, the crate is easy to take along to hotels or tents. Your dog will feel safe and comfortable in an unfamiliar place. When taking your dog to the vet or to the groomer, they are often put in kennels; for a dog that is crate trained this stressful experience is reduced by the dog having the same positive “den” feeling. From a human perspective, confinement is horrible; but to a dog it is safe and comforting. Some mistakes that lead to bad dog behavior stem from people not being able to leave their personal feelings behind. Many dogs are left out in the yard during the course of a work day, you are not doing your dog any favors by leaving them outside. A dog that is put outside when the owner is away tends to pick up many bad habits such as barking, digging, and chewing. Not to mention that this type of training doesn’t encourage house breaking, the dog never learns to hold it. Also, leaving a dog outside during the hot summer months, even with shade, can lead to heat stroke and death. Puppies and new adult dogs left out in the home alone can also get into trouble, which includes chewing, having accidents and pretty much anything they can get their noses and teeth into. Eliminate these problems by simply crate training. When using this method, one can be assured that the dog is in a safe place while the owner is gone. When someone is home, the dog can be supervised out of the crate and then disciplined for any negative behavior. Catching the dog in the act of being destructive or chewing is the best time to discipline. This assures that the dog can make the connection of why it is being punished. When you don’t catch him in the act, don’t correct the dog. IT’S TOO LATE. If you choose to punish under these circumstances it will make the dog wary of coming to you and will hurt your house training efforts. A popular misconception is that the dog “knows” what he did because he looks guilty. A dog has that look from prior experiences; he knows that when you come across a mess you get angry. Your dog learned to associate a mess with your anger response. He cannot perceive the connection between making a mess in the first place and your anger. Being patient with your new pet will get you much further than getting angry. Also, never swat a dog, it will just create fear of you and rolled up newspapers. Rubbing the dog’s nose in the mess is unsanitary and disgusting. Dogs become house trained in spite of such tactics and not because of them. Always keep calm when coming upon the mess. Use white vinegar as a cleaner, this will neutralize the odor so the dog will not be attracted back to the same spot. When it comes to crate training a puppy, buy a crate that the pup will be able to grow in to. As an adult, the dog should be able to stand up and turn around in the crate (make sure as a puppy that the crate has some sort of divider, so the puppy can stand up and turn around but not walk from one side to the other). Initially the dog or pup may whine when put into the crate. Be patient, don’t encourage bad behavior by letting the dog out of the crate every time he is whining. The best idea is to put the dog in to the crate before leaving; that way you will not be tempted to let the dog out. After you leave, the dog will settle down. After a couple of weeks, the pup will get used to the idea and will not whine when placed into the crate. Crates are the perfect tools to help establish a schedule for house breaking. Another important rule is to feed the dog on a schedule, don’t free feed. Make sure to make enough time after feeding for the dog to eliminate before putting the dog into the crate (usually about 15 minutes after the dog eats and needs to eliminate). When no one is available to watch the dog, place it into its crate area. When returning home, immediately let the pup out of the crate and let it outside to go to the bathroom. After the pup has relieved itself, let it back into the house. Now you are home to keep an eye out for any behavior that may need to be corrected like chewing or having accidents. Your dog may need to be on leash when out of the crate at the beginning to help set structure and keep the dog out of trouble. How long can you ultimately leave a dog in a crate unattended? That depends on your dog and your schedule, but it should not be longer than the course of a workday. When getting a puppy keep in mind that they have to eliminate 2-3 times more often than adult dogs. Until a puppy is 6 months of age, it is unrealistic to expect it to last more than 4 hours during the day. When getting a puppy make sure to adjust your schedule accordingly. Make sure it is a safe comfortable place for your dog to truly rest and get down time. Adjust where the crate is, depending on your dog. Some do well in social areas like the living room, other dogs will do better in a bedroom or basement where they are not distracted. Allow the dog access to the crate even after house breaking, they like having their own room. Utilize the crate any time you are gone until you know the dog can be left out in the home and not have accidents and not be destructive; for some dogs this may be months, years, or a lifetime. Leave chew toys in the crate, preferably nothing digestible. We want it to relieve stress, not contribute to the dog having an accident. Get the dog calm using distance pressure before allowing it out of the crate, use a leash if necessary. This is a great tool to help the dog understand you control the resource of space, so be consistent and it will reflect in every other area of the dog’s training. Never use it as a form of punishment. Don’t leave food or water in the crate, it will only encourage having accidents. Don’t leave bedding if your dog is a destructive chewer, this might save you a vet visit for an obstruction. Don’t crate your dog for long periods of time without doing a structured activity beforehand. Don’t use potty pads or newspaper in the crate; this will encourage your dog to eliminate. We want to encourage the pup to hold it. Don’t leave young dogs in the crate too long. Rule of thumb for leaving a pup is age in months plus 1 hour. So a 2 month old puppy shouldn’t be in the crate longer than 3 hours. Through the night allows for about 1 or 2 more hours, but keep in mind getting a young puppy, you will need to get up in the middle of the night for a potty break. To create a calm dog, we must be creating a calm mind. Here are some basic rules to enforce, or re-enforce, your dog getting calm as a default mode. Keep in mind this is not forever; practice these rules for the next 30-90 days depending on the dog. The more of these rules you follow the quicker your relationship with your dog will be everything you want it to be. No treats, they may come back, but for the beginning of training we want the dog focused on you and not over excited and focused on food. No toys readily available, if it’s play time, take out a toy and interact with the dog. When play is over, put the toy away. Do not allow on couches, sofas, and beds. No beginning and no table scraps. Do not give your dog intention when staring at you, whining, or barking. You initiate all the activities; help the dog learn you control everything. You always walk ahead of your dog and you sit and sleep higher than your dog because position matters. When working with your dog, enter or exit first, dog second. Take your time to calm the dog before moving in and out of doorways. Your dog will have to stay in a crate, tethered, or on a dog bed unless being exercised or otherwise interacted with. This helps the dog to understand you control space and also to give both you and the dog down time to rest. Limit talking to your dog as they do not understand words, they read our body language and the energy behind it. Words can sometimes over excited and create the opposite effect we want. Stay calm when working with your dog. ACKNOWLEDGEMENT: The “Two Week Shutdown” was created by Stacie Sparks and revamped by Bella-Reed Pit Bull Rescue. 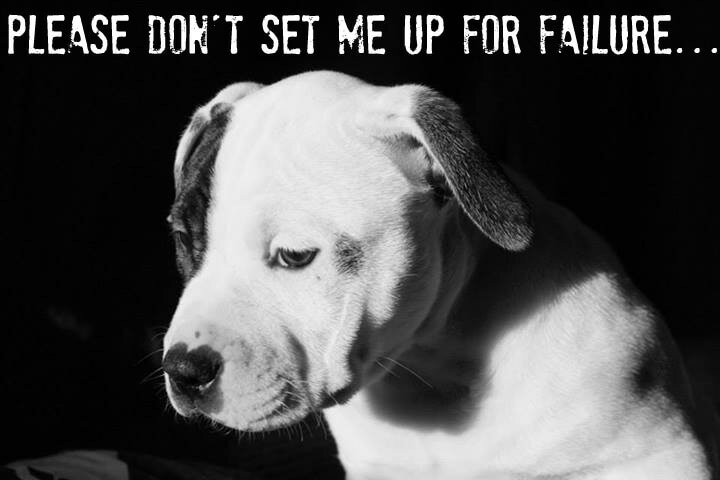 “Creating Structure at Home” was created by Heather Beck, owner of K9 Lifeline at www.k9lifeline.net (k9lifelineinfo@gmail.com) and incorporated into the “Two Week Shutdown” by Bella-Reed Pit Bull Rescue.